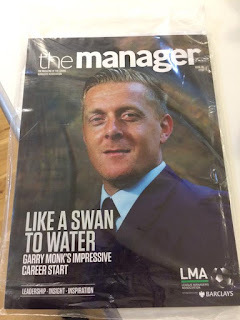 With the Swans finishing 8th in 2014/15 there was even talk about Monk being a possible candidate for next England manager with Hodgson presumably departing after England underwhelm at Euro 2016. 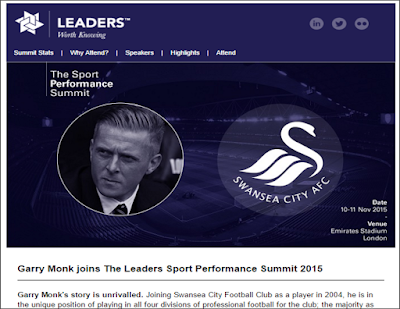 As much as I'd have love to have gone to hear from Monk, Leaders is a bit out of my price range to go just as a sports fan rather than as someone actively working in the industry. I did however keep an eye out on Social Media to see what came out of the event. 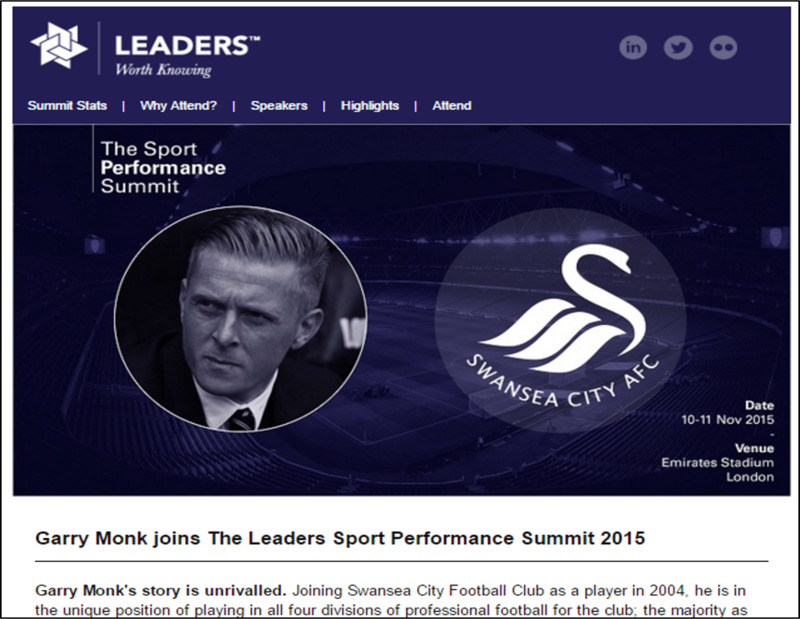 As I wasn't there, I've no idea why the change is made and there may be a perfectly valid reason, but have the horrible feeling that the organisers felt it might be a bit awkward to talk about maintaining success with a speaker who (at time of writing - 18th Nov) is 1/4 to be next Premier League manager to leave. 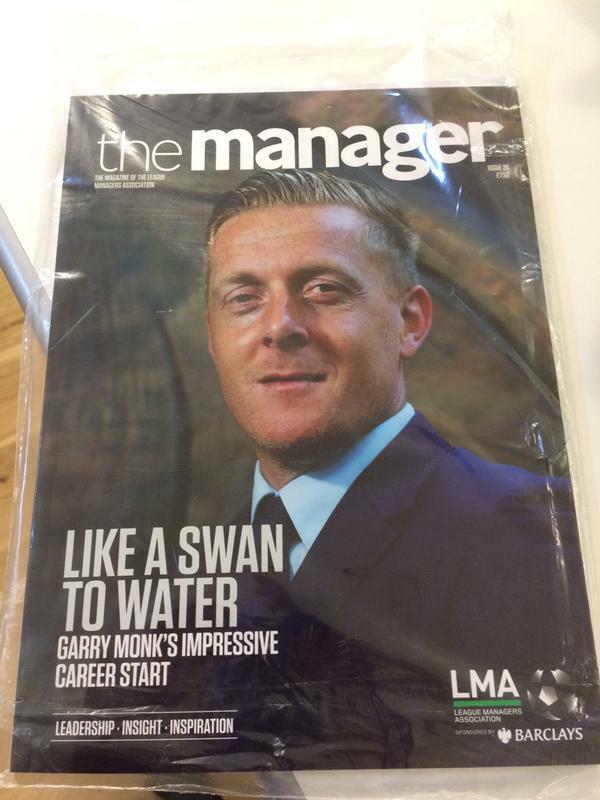 This brings me to the question, 'Should Garry Monk's job be at risk?' For me the answer is absolutely no, the last couple of months haven't been pretty and if I had to describe the Norwich performance in a word it would be 'Tetchy'. If you look at 4 of the 5 league defeats this season the common theme has been a lack of cutting edge up front and maybe a lapse of concentration or sloppiness at the back resulting in a defeat. The goal conceded away to Watford was route one, flick on and a finish. Stoke at home was an Omnishambles of multiple mistakes resulting in their 4th minute penalty. Arsenal's first was where Ash totally misjudged the corner after Swansea were arguably the better team. Norwich away was a lack of concentration at a corner again. The defeat away to Southampton probably the only result which wasn't debatable. Any side can 'If only' pretty much any match but it's small margins between success and failure. There's no point saying 'Why aren't we like West Ham or Leicester' as any season there's likely to be 1 or 2 teams who start the season strong but come the end of the season they'll probably both finish no better than 8th (although that's not to be sniffed at). Likening the current situation to that when Laudrup was fired is to me a false comparison, despite winning the league cup and the Europa League win in Valencia, things seemed on a downward spiral since the club went on a mid season break shortly before the league cup final, returning to get battered 5-0 by Liverpool the week before Wembley. 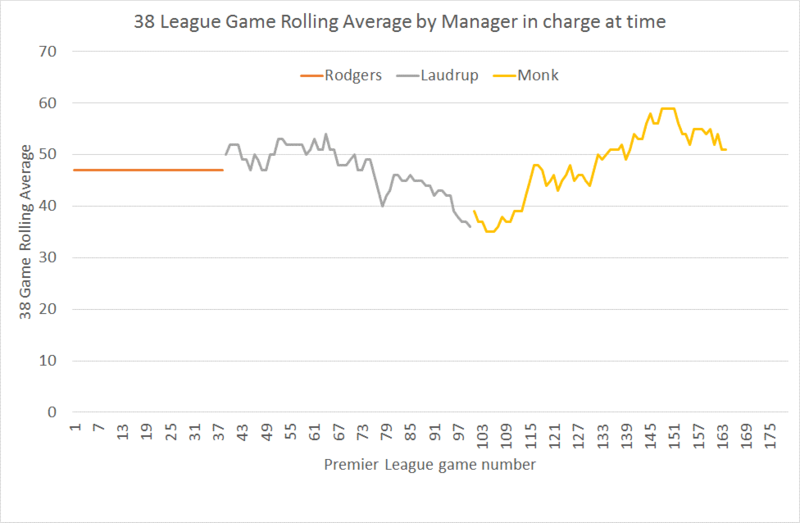 38 Game Average - Laudrup's peak happening just prior to that Liverpool game (and also still partly buoyed by Swansea's end of season form under Rodgers). In the long run then, things look decent but ultimately 'in the long run we are all dead' and the short term is what gets the attention. Much has been made of Swansea being 'Not just another club', but with the new TV deal on the horizon, it's possible the owners will get twitchy although I hope that isn't the case. There's been talk (how accurate I don't know) about the hierarchy looking for Monk to bring in a senior hand (possibly a director of football), whatever you think about that kind of structure at a club I find it hard to see how it's anything other than destabilising for Monk in the current climate. As mentioned in a piece by the Swans Trust today, there's been a huge leap forward in facilities at the club in the last couple of years but that maybe there isn't much budget to buy our way out of any slump, 'too good to go down' is a dangerous game to play but unless there has been some almighty disruption between manager and team I so no reason to feel our Premier League place is truly at risk. In terms of financials, I'd disagree with the need to expand from an income point of view, 6,000 extra seats would generate £2-4m a year, depending on number that were sold as season tickets or to Kids/Senior Citizens etc., (and how many games sold out). Although that's not chicken feed, a mid-table club in 2016/17 will probably be taking in £125m in TV money so while 'every little helps', from a financial perspective any change in gate income will not produce a massive change, especially short term as it would require capital investment to do the expansion. Doing it to increase the fanbase and longer term drop prices would be great but that's a different issue. Crystal Palace is worth just under £200m at the moment. If Selhurst Park is renovated, could easily be worth double that inside of 5 years. One of the things that makes Swansea stand out as a place is also something which stands in its way in terms of growth of the club and that's its location. Having pretty much nobody to the North, South or West and your historic rivals to the East means that you can't bring in people from a wider catchment area like Palace could do, although as mentioned above with Swansea and the gate money, I don't particularly see the burning need to drive up attendances or create a bigger ground when so much of the £ is in the TV deal. If you're a Champions League level club and can pull in corporate hospitality and high end spenders then match day is important, otherwise you're effectively a media company that has a few people come along to watch, however dispiriting that may sound.